Jane Eng paid $650 a month for a one-bedroom cottage in Live Oak in 1990 when she first moved to Santa Cruz. Her wages increased 40 percent since then, and her overall rent increased by 450 percent. She now pays almost $3,000 a month for a two-bedroom house. Eng is part of Service Employees International Union (SEIU) Local 521, Region 2 as an IT worker for the Santa Cruz Metro. She’s been forced to move twice since moving to Santa Cruz 28 years ago because of increasing rents and evictions, but stays in Santa Cruz because she loves the small, local environment. “It’s worth it, but no one wants that burden,” Eng said. Santa Cruz resident Jane Eng remains positive despite the struggles she faces paying rent in Santa Cruz. The housing crisis in Santa Cruz is undoubtedly out of hand, but it’s difficult to decipher how many people it affects and to what extent. The No Place Like Home (NPLH) project gathers data on the growing issue by investigating how Santa Cruz’s residents experience the housing crisis. Their research comes at a time when voters have the potential to enact rent control through Measure M in the upcoming elections. NPLH was created in 2015 by UC Santa Cruz professors Steve McKay and Miriam Greenberg. Students research the housing crisis by interviewing and surveying Santa Cruz residents and workers, including Eng about their experiences. UCSC student researchers presented this year’s culmination of research in a community forum on Oct. 18. 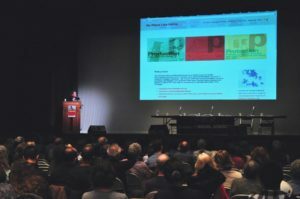 The forum included 25 community housing organizations, student presentations of housing research data and a panel discussion on rent control and other solutions to the housing crisis. Presenters and panelists advocated strongly for passing rent control in the form of Measure M, but also for passing Measure H and Propositions 1, 2 and 10, in light of additional testimonies and NPLH research. The solutions NPLH proposes are a combination of producing new affordable housing, preserving existing affordable housing and protecting tenants and their rights, Greenberg said. In past years, NPLH focused on renters in Santa Cruz but missed those who were priced out of the city because of housing. This year the project turned its attention to the experiences of Santa Cruz city workers. They found renters, homeowners and low- and middle-income residents alike are concerned about their housing. Of 442 Santa Cruz city workers in SEIU surveyed by NPLH, almost 50 percent of them can’t afford to live in the city. The survey found shared problems among workers were scarcity and high cost of housing. This is shown in the number of forced moves — those caused by any factors outside one’s control — that the survey found. Of the workers who moved while working in Santa Cruz, 45 percent were forced. 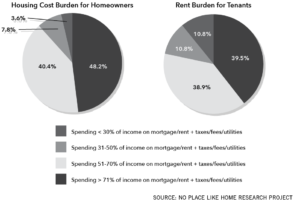 Renters aren’t the only ones who struggle with housing. About 60 percent of homeowners and 50 percent of renters who were surveyed spend more than 30 percent of their incomes on mortgages or rent, including taxes, fees and utilities. It surprised researcher Jeff Hao, a UCSC fourth-year, that the crisis affects homeowners too, because of rising property prices. 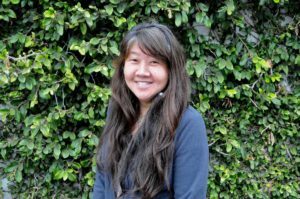 Learning about the housing crisis by researching with NPLH inspired Hao to join Students United with Renters and organize for housing justice, particularly for the passage of Measure M.